Damp and rising damp problems solved. Damp courses installed. SWF is a reliable, affordable roofing business offering quality building services across Shropshire, Cheshire and North Wales offering damp courses and damp proofing. Our main office is based in Manchester and we have bases in Whitchurch, Chester & Warrington and we take care of any roofing job across the region. Contact us for a free no-obligation quote. There is no callout charge, we give free advice and estimates, do not take deposits, are fully insured and are Environment Agency registered and we recycle all wood and plastic. Damp is one of the most common problems that affects properties, Not only is it damaging to the structure of a building but it can also negatively affect your health. 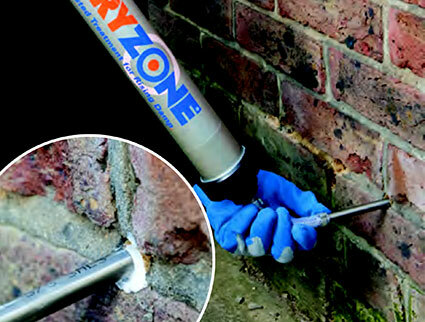 Damp proofing is a process that involves treating the walls of a property to prevent damp and its associated problems. Knowing the cause of the damp is essential to treating it properly so proper diagnosis by a professional is recommended. What makes damp proofing so important for properties suffering from damp is that it provides a long term solution that will prevent any moisture from entering the interior walls. This is essential because once water starts to get through to the interior spaces of a property then it’s only a matter of time before problems such as wet rot, dry rot and timber decay occur. There are many obvious signs of damp to look out for including mould, damp patches and flaking walls. You may suspect that your home is suffering from damp if you have noticed one or more of these signs. Please contact us for a free, no obligation, quote now. Rising Damp – Rising damp is where a building will absorb moisture from the ground which causes damage to the foundations. This type of damp will only affect the bottom floor of a building. One of the biggest tell tale signs that a building has rising damp is if you see a ‘tide mark’ across the bottom of the interior walls. Condensation – Condensation is an extremely common type of dampness. More severe cases of condensation will result in black mould appearing on the interior walls of a property. Because condensation is the main culprit, this type of damp is usually worst in the winter months. 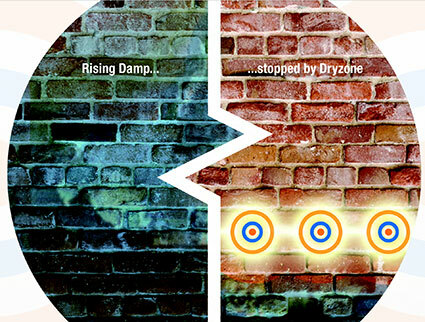 We use Dryzone products, the best on the market. The Problem: Whenever Rising Damp is diagnosed, it is important to have the condition correctly treated, as failure to do so can cause damage and devaluation to any any property. The Cure: We will install you a new damp proof course by drilling holes in the walls and injecting an effective damp proof membrane. Once the damp has dissipated we can also inject a concentrated solution that produces a chemical reaction and forms an additional layer of protection against rising damp.